Where is ReStore and what are ReStore's hours? ReStore is located at 1310 Conant Street, Maumee, Ohio. Hours are 10am-6pm, Tuesdays through Saturdays. We are closed Sundays and Mondays. We closed on the following holidays: New Year's Day, Good Friday, Fourth of July, Thanksgiving Day, the day after Thanksgiving, Christmas Eve, and Christmas Day. Yes. Our ReStore is open to the general public. Everyone is welcome to shop and support our mission. How can I donate to ReStore? Donations are accepted at ReStore Tuesdays through Saturdays, from 10:30am to 5:30pm. If you are unable to bring your donation to us, you can schedule a pick-up by completing our online Donation Form or by calling 419-382-1658. Items are selected based on our ability to sell them in ReStore. Some donations may be declined because of safety concerns, facility limitations or marketability. Inventory includes furniture, windows, doors, appliances, paint, paint supplies, lighting, carpet, tile, kitchen & bath cabinets, sinks, toilets and more. The Donate to ReStore page will give you a list of what we accept and then sell. Since we receive new donations every day, like our Facebook page to follow daily updates and see pictures of our inventory. Tagged prices are only discounted by the staff if the item has been on the floor for set intervals of time. The tagged price is the current selling price and no discounts are negotiated on the floor. We offer a 10% discount to military members and first responders (police, fire EMS). Must present valid ID at checkout. Can I make purchases over the phone? We have a first come, first serve basis for purchases. We do not do purchases over the phone. How long do I have to pick-up my merchandise? 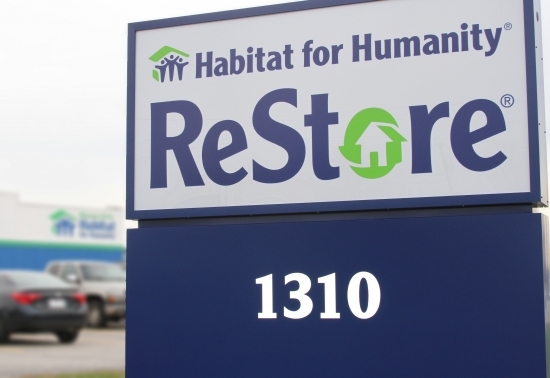 You can hold purchased merchandise at ReStore for three days. A storage charge of $10 per day will start on the fourth day after purchase. After 30 days/storage charges exceed sale price, item and payment become donation. Upon request, a tax donation form will be provided. Pick-ups must be completed by 5:30 p.m. Tuesday - Saturday. Do you deliver purchased items? No, we do not offer delivery service, but we offer a three day hold on purchased product to allow you to make your own pick-up arrangements. All pick-ups must be completed between 10:30 a.m. - 5:30 p.m., Tuesday - Saturday. Returns and exchanges must be made within 30 days of purchase. Original receipt is required at time of return/exchange.